1) Paris was born in Essex, England. I picked her out at 5 weeks old from a litter of 12 pups. As all the pups were absolutely gorgeous, I chose her by a simple, little, white spot on the back of her neck. 2) She came home with me to Wokingham at 8 weeks old and I named her Paris after my favorite European city. 3) She has visited many "must sees" in England including Stonehenge and the Roman Baths in the city of Bath. 4) She was basically stolen from me at 4 months old by the "crazy man" I was trying to separate from. 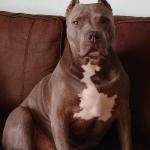 5) The breeder who originally sold her to me conspired a plan to find her in hopes she could be returned to me. IT WORKED. On News Years Eve, while back in the US for a visit, I received a call from England saying the breeder had Paris! She was peeing with excitement at our reunion, 2 weeks later! 6) Paris got stoned in St Albans, a city in southern Hertfordshire, England, around 22 miles north of central London. It was here, while I was out at a pub one night, that friends who were keeping Paris for the night decided it would be great fun to blow SMOKE (of the marijuana kind) up her nose to get her HIGH. Well, they came to pick me up well past 2 AM with a VERY HAPPY Paris in the back of the car. I was furious at the time but now, I must admit...she was pretty damn funny that night. 7) Paris and I stayed on the Isle of Man, living on a private equestrian estate, for several months. This is where she first began her life around horses. Unfortunately, this is also where we learned that ALL SWANS IN THE UNITED KINGDOM are PROPERTY OF THE QUEEN OF ENGLAND, and it is far from appropriate to allow your crazy akita to chase them. Furthermore, most citizens of the UK will not hesitate to inform you of this fact! 8) We moved to North Wales where we learned that all the beauty of an akita simply cannot match the obedience and admiration of the native sheep dogs. BABE the pig handled the job just fine but Paris wouldn't even come when SCREAMED AT, so obviously dogs obeying subtle hand gestures to do hours of work for their masters certainly showed Paris up. I couldn't have Paris be shamed so I decided to teach her something REALLY IMPRESSIVE, so in a little seaside village I taught Paris to pull me on my roller blades. Well, you all may not be impressed but picture the WELSH people who had never seen an akita nor roller blades in their entire lives. Ha. 9) Paris and I spent many a night, week, month, in hotel rooms when more times than not we had to share the free continental breakfast just to have something to eat for the day. Good thing she didn't care for coffee but she sure did hog the eggs and blood pudding. 10) I didn't take a job offer from King Hussein of Jordan, to work with his family and horses because the admin folks told me I would have to keep Paris locked up all day and she would never be able to run free on the horse property. 11) Paris spent 23 hours in a crate to make it to her new home in the US. 12) Paris was by far the BEST THING I took home with me after spending a year in the UK. 13) Paris was with me for the darkest and the brightest times of my life. 14) She walked me through my own heart health issues and helped me become active again after nearly 2 years of total physical misery. 16) Paris healed my heart after losing my Father a few years ago. 17) Paris survived Breast Cancer after suffering through 2 major mastectomies. 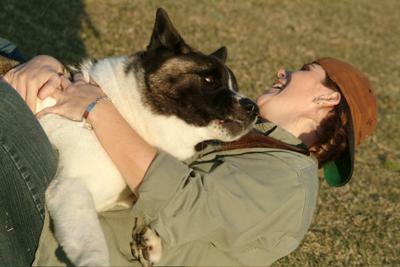 18) I got my first dog Keesha, a fawn akita, when I was 21 years old and she lived to be 14. I have not been without a dog for more than 2 weeks ever since. I am 42. 19) Paris is nearly 12. 20) In November of 2008 I phoned Margaret, who bred Paris, and thanked her again for caring enough to help me get Paris back. She was thrilled to hear from me. She still resides in Essex, England. 21) Tomorrow Paris will go to Heaven. 22) Euthanizing a pet is an agonizing event but I believe in my heart that it is the kindest thing to do. 23) I will miss Paris terribly. 24) I have learned a lot about myself through being a dog owner. 25) I pray for the strength to handle the situation tomorrow so that Paris only feels love and peace as she leaves this Earth.